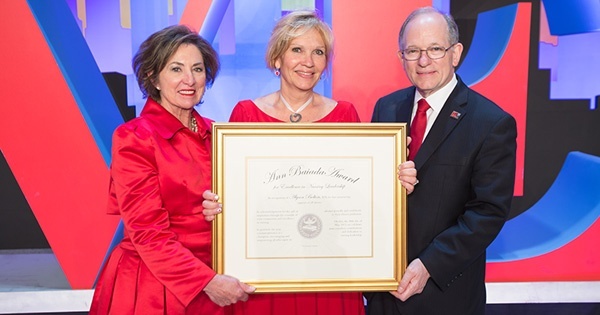 Alyson Bolton, center, winner of the Ann Baiada Award for Excellence in Nursing Leadership, with BAYADA Director Ann Baiada and BAYADA President and Founder Mark Baiada. Alyson Bolton, RN, CPN, a transitional care manager with BAYADA Home Health Care, was recognized with the prestigious Ann Baiada Award for Excellence in Nursing Leadership. Bolton was honored for exemplifying the highest standards of nursing excellence before more than 2,000 employees at the company’s recent annual awards meeting held in Philadelphia, PA.
BAYADA is accredited by Community Health Accreditation Program for meeting the industry’s highest nationally recognized standards of care.